As a player in the 1970s, Ivan Golac had a great 10 year spell as a full back with his home town team Partizan Belgrade. At the age of 28, he was transferred to Southampton in 1978 where he spent the best part of the next 8 years until he retired in 1986. 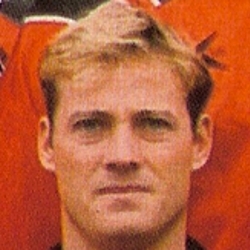 Golac returned to Partizan to take up a coaching job, becoming assistant manager in 1989 and eventually stood in as manager for most of the 1989/90 season. He returned to Britain in the early 1990s, and after a short spell as manager at Torquay United in 1992, he became the surprise replacement for long standing manager Jim McLean, who had retired at the end of the 1992/93 season. Golac's appointment was the first time a Scottish Club had employed an overseas manager. 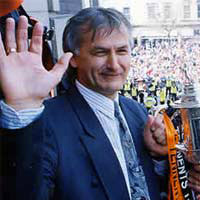 Golac's laid back attitude was in complete contrast to McLean's style, and this must have been a contributing factor to the Club finally winning the Scottish Cup for the first time in their history during his first year at Tannadice. Unfortunately the teams League form under Golac did not match that of the 1994 Cup run, with a 6th place finish hiding the fact that the team were only 2 points away from the relegation zone. This continued into the 1994/95 season, with erratic form seing the team sitting 3rd bottom in the Premier Division and out of the Scottish Cup in March. The board moved quickly and Golac left the club by mutual consent.